The holidays always put me in a giving mood. So I thought I’d give something special to my readers before I hop off to a week in the Arctic Circle: an excerpt from my upcoming novella DIE ONCE MORE. A part of the DIE FOR ME series, this is the second novella from Jules’s point of view. (The first being DIE FOR HER.) DIE ONCE MORE shows Jules in New York, just after returning from the final battle with Paris’s numa. This digital novella will be released on February 3—just in time for Valentine’s Day!—and you can pre-order it here. I hope you enjoy this taste of Jules’s life in the Big Apple. The song that feels perfect with it for me is Big Data “Dangerous.” (But don’t watch the video – it has nothing to do with it and will ruin the effect for you.) The song has the New York feel, and says (for the most part) what’s in Jules’s head at the beginning of the story. “Two months creep by, and things do not get better. Every day is like its own separate death, bullet-riddled with memories and gutted by the twisting knife of loss. Entwined with the memories of Kate, and the longing for a love that will never be, is the loss of my best friend. My mood swings wildly between missing the camaraderie of a brother I had for over seventy years, and resenting him for being the recipient of Kate’s love. And then there’s Jean-Baptiste. Although , I loved and respected the man. I should be there to help support Gaspard in his grief. So there’s that guilt to deal with, along with all the rest. Losing Vincent is like losing my right arm. And since Kate has my heart, and I feel spineless for abandoning Gaspard, you could say I’m presently suffering a major lack of body parts. The only way I survive is to never stop moving. I make sure I’m always surrounded by others, so I won’t have time to think and end up imploding like a dying star. I walk incessantly. I know the streets of Brooklyn and Manhattan, my two chosen boroughs, well enough by now to have an accurate street map in my head. I sign up for three four-hour shifts per day. Although that first day was an exception, and New York’s numa are staying suspiciously out of sight, there are enough cases of suffering street people, suicide attempts, domestic violence, and near-fatal accidents to keep me on a continual high from the life force I absorb from these saves. He has been an impeccable welcome rep. He got me moved into my room at the Warehouse and had it furnished with what I asked for. (I didn’t really care, but he pushed me for details until it ended up looking pretty much exactly like my room in Paris . . . besides the floor-to-ceiling windows with an enviable view of the East River.) He got me weather-appropriate clothes, made sure the armory had what I needed (sending off for some antique swords so I would “feel at home”), and introduced me to our kindred artists—of whom there are many. Seems like every revenant artist in America wants to be here. Faust even gamely accompanied me to my first Midnight Drawing Group meeting at the Warehouse. But after Gina, one of our bardia sisters recruited to pose when our human model didn’t show up, perched atop the stool and dropped her robe, Faust’s jaw dropped too. Her response was, “Draw or scram, Faust.” He hasn’t been back since. His third-generation Italian-American upbringing and his stint in the tough-guy New York fire department never prepared him for people like the artists I hang out with. Poor Jules. Does anyone want to give him a hug and make him feel better? Chace, I mean Jules, hoping a special person will call. A Holiday Offer to Die For! Last year I had so much fun with my holiday promotion, that I’ve decided to amp it up this year. a frenzy of holiday joy! 1. 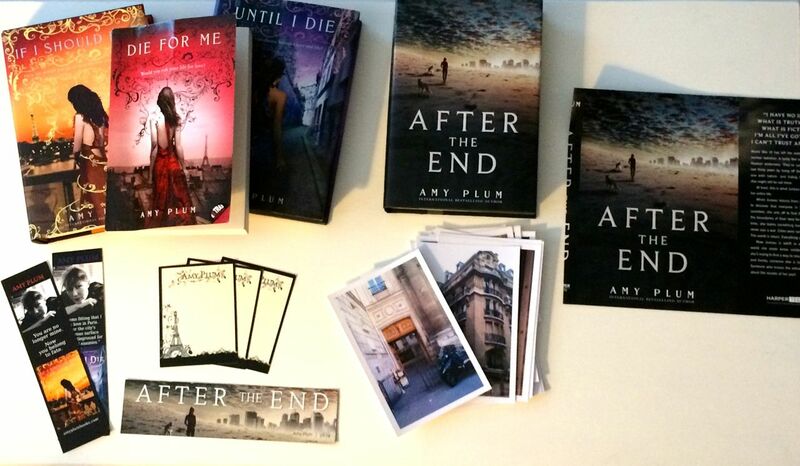 Single books: For every copy that you buy of DIE FOR ME, UNTIL I DIE, IF I SHOULD DIE, or AFTER THE END I will send you an Amy Plum bookplate that is signed and dedicated to the person of your choice, and mailed from France. 3. DIE FOR ME package: If you buy all 3 DIE FOR ME books + DIE FOR HER digital novella, + pre-order DIE ONCE MORE digital novella (that’s 5 books in all) I will send you 3 bookplates, 2 bookmarks, and a photo taken by me of one of the DIE FOR ME locations in Paris, with a handwritten passage describing the location on the back. 4. AFTER THE END package: If you buy AFTER THE END and pre-order UNTIL THE BEGINNING, I will send you 2 bookplates, an AFTER THE END bookmark and an AFTER THE END first-run book cover with a passage of the book handwritten by me on the back. The rules: this can be hardback, paperback or e-Book, but it has to be a first-time buy (not a used book). You can buy anywhere—online or on the street, just scan the receipt and email it to me. This is an international offer, good for any translation of my books in any country. Email your receipt to katieloumercier at gmail dot com. Offer runs from today (Nov. 8) to Dec. 19 (the day before I leave for Christmas vacation). Want to see what your gift could look like? How’s that for a ho, ho, ho? Thank you all, in advance, for wanting to share my books with your friends and family. I hope this gift makes everyone’s holidays even merrier!